I wanted this book to be a history book and it started out that way. 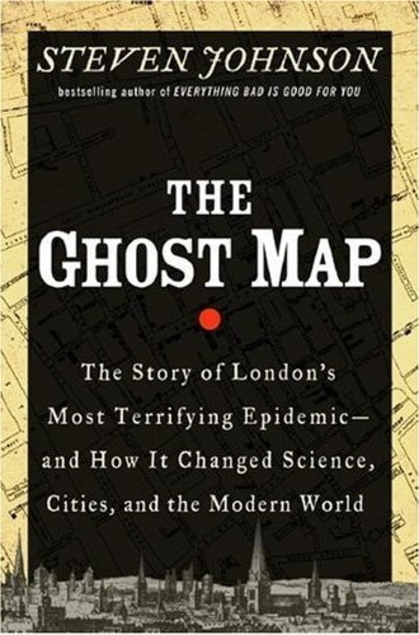 The Ghost Map tells the tale of the Cholera Epidemic of 1854 and is a fascinating story of science and sleuth. But then author Steven Johnson kept going down these paths--paths of excruciating detail about Victorian London and how crowded it was and how much it stunk and how filthy it was. I wondered all the synonyms that Johnson used for excrement. (You'd be amazed!) It all seemed too much. I kept wanting it to get back to the story's mystery and how it was solved. And then, when I reached the end, I realized that that WAS the story--the birth of the modern city and all the perils that it entailed and how we are still learning how to live in large, metropolitan areas together as we continue to move from rural areas. I guess next time I need to pay more attention to the sub-title. The last chapter was really an informative one as Johnson explains the factors that affect modern urbanization and whether, in his opinion, we can survive them. I listened to this book on Audible, and now I wish I had that last chapter in print, so I could take notes. He's got some really good stuff in there. And I'd like to go back and review some of those very detailed sections that I thought were dragging the story and turned out to be the data points to Johnson's main thesis. All in all an interesting book--I learned something both about cholera and about cities. Recommended. Stephanie, I'm glad that you are able to review books for me. I'm really not too interested in books that are full of "excrement".